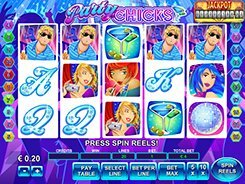 Party Chicks is a sparkling video slot with a disco and party theme. Played over 5 reels and 20 paylines, the slot will take you to a dance floor where you are free to dance all night long. The symbols on the reels include classic playing cards as well as a few young men and women dancing, drinking and flirting. The maximum bet of $1000 per spin boggles the mind and is a perfect choice for high rollers. Anyway, a player may bet as low as $2 per spin and still have all paylines in use. 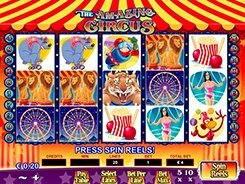 Along with regular symbols, the slot features a wild, a scatter, the Free Spins symbol and the Bonus symbol. The wild acts as a substitute for other icons and doubles payouts when substituting. Besides, five wilds landed on a payline create the most valuable combination that wins 3000 coins or $150,000! The blue-haired lady is a bonus symbol, with three of them unlocking a bonus feature that awards up to 3000 coins. A free spin round with 5, 10 or 15 free games is granted when you hit at least three Disco Ball symbols anywhere on the screen. With this in mind, Party Chicks has many big payouts and rewarding features for a highly entertaining gambling experience. PLAY FOR REAL MONEY!